The birth of a child is a joyous occasion, and also an opportunity to lavish on baby and parents alike thoughtful gifts of love and support! Copperfield’s stocks some of the cutest, most extravagant, most fun gifts for babies and young children. If you are looking for a baby shower gift, you should come in to our store and see what we have on hand. One of our favorite brands is a French company called Moulin Roty. 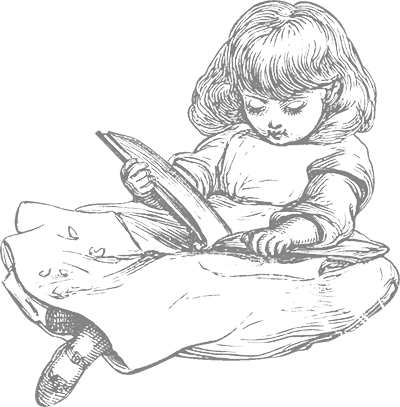 They make toys and other items for all ages of children with a wonderful sense of color and whimsy. 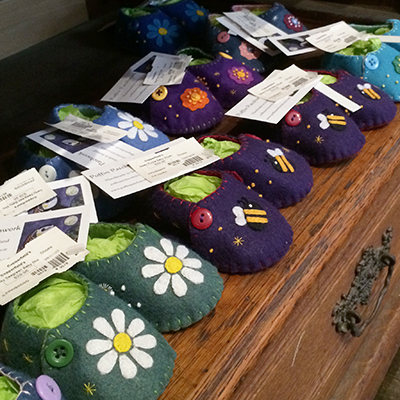 Some of the baby items we currently offer are Bluebird Rattles, Les Zazous squeaky toys, and the darling Les Pachats booties. 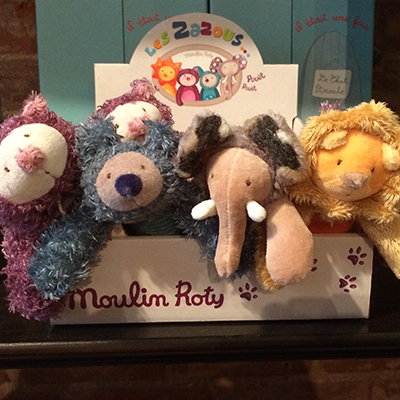 For toys for children of other ages from Moulin Roty, please see our Toys page. 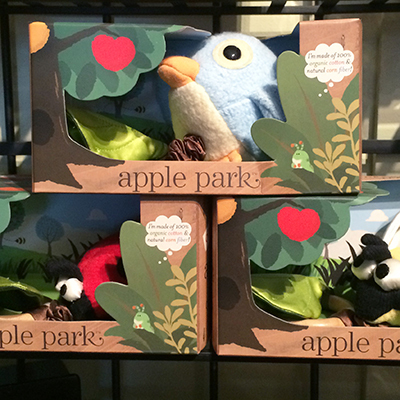 Another great line of toys and gifts for babies is Apple Park. Like Moulin Roty, Apple Park makes toys and other items for children of various ages, including babies, but their claim to fame is that they make their items from organic and recycled materials. Rattles, stuffed animals, teething rings, caps, and booties are some of the items we offer from Apple Park. One of our most popular collections is that of the darling designs of Maileg, a Danish toy company that produces some of the cutest toys around! Maileg’s toys are seasonal in nature, so our stock changes throughout the year, but some of the mainstays are foxes, badgers, monkeys, cats, and more (their outfits change with the season!). These are in addition to their lines of darling rabbits, bunnies, and mice, all of which can be adorned with different pieces of clothing and accessories! Another popular line is Baby Aspen, which combines the whimsical with the practical. A perennial favorite from Baby Aspen is the Crock in Socks: a darling crocodile rattle toy embracing a bundle of socks ready for wear! Another fun choice from Baby Aspen is our shark robes—terry cloth hooded robes in the shape of a shark. We also often have among our vintage and antique items gifts of other eras, such as silver spoons and cups, bronzed booties, antique toys, and more. If you’re looking for a cooky gift, one of our vintage or antique items might be just what you’re looking for! Please come in to the store and speak with a friendly sales associate if you need help finding the perfect baby gift. And don’t forget, we have a massive selection of wrapping papers (including child-themed), and we gift-wrap!